After a long day, it is time for a cleansing ale [or two]. Our residence, called "Once Upon A Time", has an upstairs loungeroom for its guests, and they have a plentiful supply of cold beer at reasonable prices. So...we relax for a while before bed. J'aime bien le nom de cet endroit. Ray: Je trouvais ça plutôt attirant, Martine. That looks very posh to me, Ray. You clearly relaxed in style. 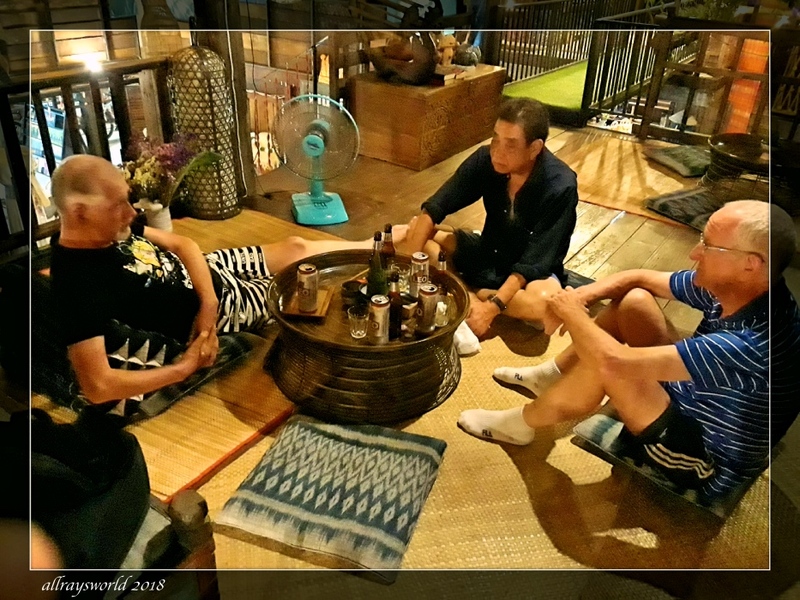 Ray: Very posh, Ginnie...a bargain, too, at US$11, including sumptuous breakfast, real coffee, and free use of the bikes you will see tomorrow. That looks quite the perfect place for you to have some beers. Ray: Yes...perfect...as our beds were less than 10 metres from where we are sprawled, Astrid. The table does look somewhat like you describe, but it is actually a traditional occasional table made from lacquered papermache. This is all very good and life enhancing. It is an inspiration to me that getting old isn't as bad as some might make out..
Ray: I am with you on that, Sport. The average age of the team is 70 years, and we can still manage to squeeze a lot into a day and then repeat next day! Sounds like convivial way to spend an evening. Am I right in thinking that it probably would not be a good career move to become a chair salesman in Thailand? Ray: A chair salesman would be unlikely to become a Thai version of Bill Gates, Alan. Ray: The floor is a stable base to relax on when you have consumed a skinfull of beer, Lisl. The name of your hotel reminds me of the opening words of nearly all the books I have ever read. Ray: Did you give up on books at age 7, Chad? Ray: Our Fab4 Tours always have very well-planned culinary aspects, Bill! Oh, I like you sitting and relaxing around the bottles of beer, typically men. Why does your residence have an English name. It is not wishable that the English language is dominating all our countries, sorry, in my humble opinion. Ray: It was a very good room in which to relax at the end of a full day, Philine, and we are sitting barely 10 metres from our beds. The Owners of this place are Thai, but lived and worked in USA for more than 20 years. They returned to Thailand recently, and set up this place to help preserve the ancient arts of cotton spinning, dyeing and weaving. "Ga La Kungeun" is the approximate Thai equivalent to "Once Upon a Time", Philine...and is a common Thai saying. However, The SE Asian Economic Community has chosen English as the official Inter-Country language and so regional tourism centres are using English deliberately. In this city...in Thailand but not far from the borders of Laos and Cambodia...Thai, Laos, Khmer and English languages are somewhat inter-mixed. Open air and a fan. You can't beat the heat, eh. Ray: Tim and I dislike air-conditioning, so open air and fan works fine for us, Mary. Ray: I was quite chuffed by that, Tom. Essential everlasting experience. A series of good-night caps with some friends. Ray: Oh yes...important aspects of the Fab4 Tours, Louis. it looks inviting with the slightly warm temperature lights, Ray.